When it comes to food, I have one more fond watermelon memory. Once we kids had our fill of watermelon my dad would cut the watermelon into small pieces and store it in refrigerator for late morning snacking and mom would collect all thick skin to make delicious Dosa. My sister and brother preferred sweet watermelon dosa prepared adding grated jaggery ground with rice and white part of watermelon pieces. The spicy version of dosa prepared adding dry red chillies and aromatic cumin and coriander seeds were my and my dad’s favourite. When Bee and Jai chose Watermelon for this month’s AFAM which is a brainchild of Maheshwari, I knew what I wanted to contribute without any hitch and hesitation or confusion which I usually have whenever I participate in food events. Watermelon Dosa might sound bit unusual to most of readers but you have to try it to know how tasty and delicious it is and how quick and simple it is to make. Unlike many dosa recipes, water melon dosa doesn’t need any fermentation process. Addition of coriander and cumin seeds with dry red chillies takes it to another level of taste. The peel left after eating the red part of watermelon is used to make this dosa. 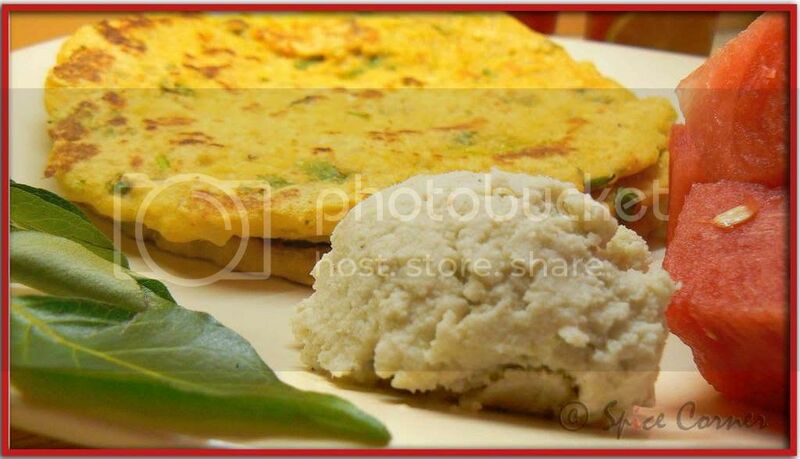 The outermost green part is peeled and only the remaining white part is used to make this dosa. Cut these white parts into small pieces and grind them with rice and other spices to make batter. Soak rice in warm water for at least 2 hours and drain water completely. Grind coconut, rice, red chillies, coriander seeds, cumin seeds, salt to taste and about 3 cups of chopped watermelon rinds without adding any water. If the batter is too thick add little more watermelon rinds and grind. The batter should be little thinner than Idli batter consistency. Now add finely chopped onion, green chilli, coriander and curry leaves to the batter and mix well. Keep this aside for about 15 minutes so that all the flavours blend well. Heat tawa/griddle and pour a ladle full of batter in the centre. Using back of ladle spread this into thick circle. Cook both the sides in medium-low heat till they turn golden brown by applying little oil or ghee if desired. Serve hot with Chutney or Sambar or with honey. I love my plate of watermelon dosa with honey and Ginger-Coconut Chutney. Here is the simple recipe for making Ginger-Coconut Chutney. Grind all the above ingredients adding little water (about ¾ cups of water) at a time to a smooth paste and serve with Dosas or Idlies. Watermelon is grown in over 96 countries worldwide. Watermelon's official name is Citrullus lanatus of the botanical family Curcurbitacae and it is a vegetable! It is related to cucumbers, pumpkins and squash. A watermelon was once thrown at Roman Governor Demosthenes during a political debate. Placing the watermelon upon his head, he thanked the thrower for providing him with a helmet to wear as he fought Philip of Macedonia. Watermelon is an ideal health food because it doesn't contain any fat or cholesterol, is an excellent source of vitamins A, B6 and C, and contains fiber and potassium. The word "watermelon" first appeared in the English dictionary in 1615. I am learning so many new recipes with watermelon rind. Dosa has a lovely colour. Unique entry, Sia. Gotcha first!!! 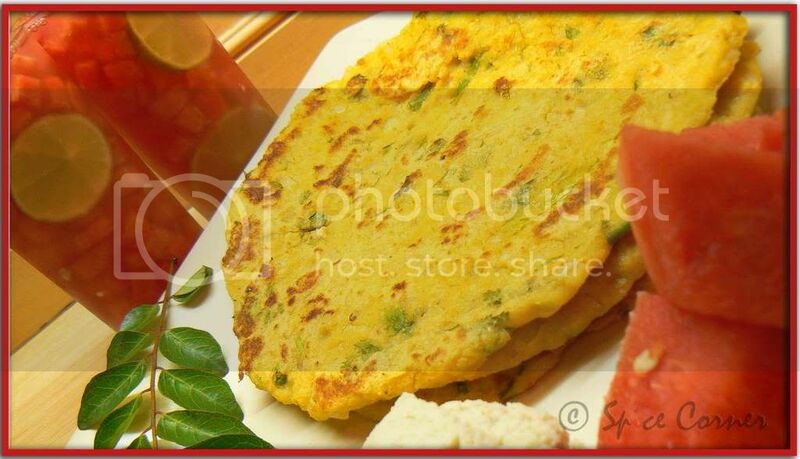 Watermelon dosas are really unique!!! Looks grand and I think it's also tastes great with little honey.Good job and a great entry. Why did you not post this before? Just a couple of days before, I threw out the outer portion of the watermelon (ofcourse after eating the fruit). Those dosas look so beautiful in the picture. Wow this is great! I have never heard of using watermelon in dosa. A unique recipe supriya. Hats off!!! hey, dosa looks yum, that deep yellow color reminds me of makke di roti heh!heh! first time i heard @ this dosa! Lovely post and nice info. Innovation at its best! i am in love (swoon.....), gotta try this one! that is fantastic supriya!! !u are amaging us with ur recipes. Looks so gooooooood!!!! i will hv to buy a watermelon to make this dosa!!! Whoa girl....what a great way to use up the rind! I've had 'handvoh' made from this, time to try this Dosa! yes, that's my kind of recipe. no waste, no fermenting. thanks for this entry, sia. yumm enage spicy version rashi ista! ACtually h heldru dose blog madu antha nanu yaru blog madidda ankande. the dosa color chenda kandtu. looks like you are very busy these days... ok bye good entry! .. bye see you.. It is a pleasure to have you back - those pics are delicious. I was telling Bee the other day that I never knew that the rind of watermelon could cooked. 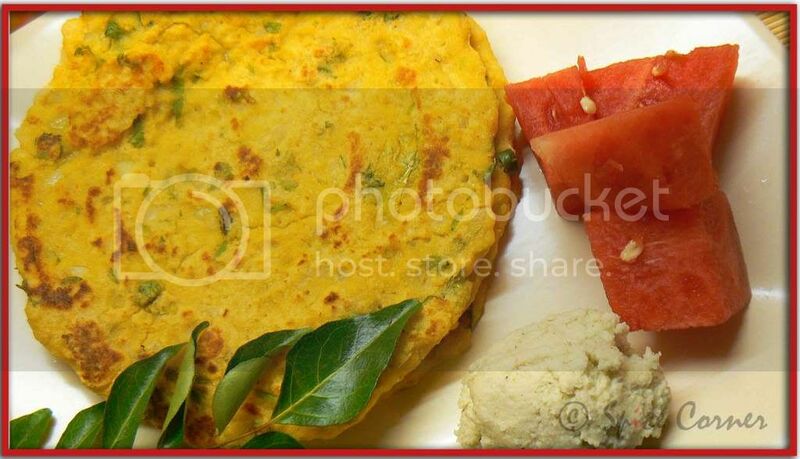 I've read 2 amazing recipes with watermelon rind today - one was a burger and now your dosa. So creative! They look so appetizing. Dang! you usually come up with such unusual and marvelous recipes. I wonder how you have the guts to experiment and be sure it will turn out good.great work. I've heard of this watermelon rind dosa, never tasted it, though! Nice writing! Hi Sia, I never knew that dosa can be made out of the watermelon rind. Unique entry. Will try it out next time I buy watermelon. As usual pics are gr8! Hey Sia... this was the dish I was hoping to post. But the watermelon I bought had almost no white portion!! Great recipe. If I get a watermelon that has white, I'm making this. Those dosas look pretty amazing! !i didn't read that rind first sia and thought how can anyone make watermelon dosa but after reading u'r post, i came to know that u can use rind for dosas, completely new to me so thank you!! Suppi, Lovely pics buddy as always. Amma ee doseya thellange yeravadu. I loved your presentation in the first picture very much. Henge idde? Kelsa thumba busy ya? Looks delicious Sia, always feel a little guilty when I throw all of the green healthy looking rind away, now that I make instant dosa with it. Chutney looks really tasty too. and yes, i have been VERY busy all these days. been working for more than 10 hrs a day in office and by the time i come bk home i will be completely exhausted. dont even get time to check blogs in between as i am away on full day meetings/workshops and training. looks like its gonna be be like this for some more months ashakka:( but i am really enjoying my job now. oh yeah. sometimes i used to get nightmares abt plants growing in my tummy coz i swallowed some fruit seeds;) he he he... part n parcel of growing up i guess. u got to try this sometimes. 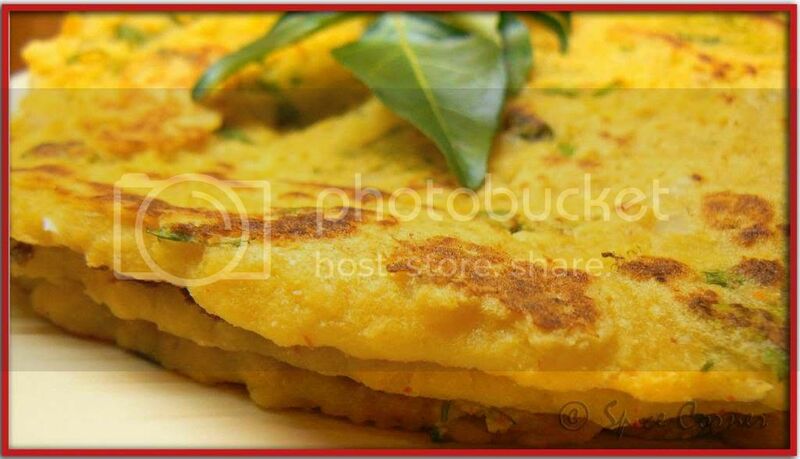 u can use rinds to make subjis/palya if u r not very fond of dosas. ah!!! now u r tempting me girl... yes, it does look like makke di roti. a warm welcome to spice corner dear and thank u for ur compliments. he he he... u bet but i didn't invent this recipe:) its a very well known recipe in karnataka. that lemonade recipe i got it from one of my collegue. the sweet watermelon pieces in lemonade tasted out of this world. it does look pretty aint it? he he he... girl, its always other way round. u buy watermelon to eat it...he he he... but yeah, this time i liked these dosas to the fruit. what? u made handvoh and didn't invite me???? thats soooooooo mean... did u post the recipe? i have been tooooooooooooo busy all these days and hardly got time to check blogs:( gonna take one day leave soon and sit and blog hop whole day:) what say? aha!!! ninnna hubby gu idu ishtava? do post ur recipe also. do u make sweet one as well? appu, kelasalli tumba busy aide. blogs check madule time sikkuttille. yavagadaru 10 mins break sikkuvaga onderadu blogs check madikondu batta idde. i really missed blog hopping and blogging and tried to check all ur blogs. but work is taking big chunk of my time these days. try it lakshmi and it tastes like budu kumbalakai dosa. adding chillies and spices makes it more tasty. thanks dear:) this dosa was quite common in our home during summer. do try it. its amazing as how our mom's and granny's thought of using watermelon rinds in many dishes. if time permits i will post more dishes using rinds. hope u do try this someday padma as it really tastes amazing. appu maraithi. kelasa tumba hectic aidu. purusotte sikkuttille:( neenu hengidde? maneli ella hengiddavu? ningala trip na pics kalusu. u make instant dosas using rinds? oh girl, u must post the recipe. i would love to learn different ways of cooking these rinds. they taste amazing isn't it? Wowww what an innovative idea.never heard of such a dosa.very nice pictures too. Yummy, I never had this dosa but heard about it. I had watermelon curry in Indian restaurant, it was ok for me :). Ah, finally I got thru to comment!! Nice idea....must give it a try. Btw, I'll mail you with my questions later, we are still deciding on a lot of things. Hope work is lighter now :) Hugs! Different version of dosa....looks nice. Watermelon rind dosa is really innovative and looks delicious.Got to try this and save the rind from next time. Thanks for visiting my blog. had never heard of watermelon rind dosa- something new. you have a lovely blog here- just love reading your posts- they r witty and informative. Great going. Hey Sia.. That looks very yummy. My mouth is watering already I guess. The coconut ginger chutney.. darn, got to invent some method where you can transfer food over internet. Talk about watermelons.. Oh fond memories. We would stand right under the hot sun and eat the water melon slice bought from the street side vendor.. and it was like the sun was never there.. hmm.. sigh..
out of the box thinking sia, I always love your creativity and making it blend so well with the traditional recipe. hee hee, love how you made the chutney into a ball! :) I tend to add too much water all the time so that it'll be easier to grind! grrr..
i don't suppose watermelon rind has a very strong taste? i'll definitely think twice before dumping the rind now! WOW! I think I will not be throwing away that rind from the watermelon anymore. This looks delicious!! watermelon rind dosa? how ingenious... when i need to impress someone is when i will make this!!!! wow sup, when I saw the title I thought there has to be a twist somewhere... :) but you really did make dosa with watermelon rind!!! :) Looks beautiful... will preserve the rind next time for sure. thank u and welcome to spice corner:) glad to know u liked my blog. using watermelon rinds in cooking is very common in our place san. there are varieties of dishes u can cook using thesee rinds. these rinds have got very neutral taste so it blends well with any other ingredients u use. do give it a try. a warm welcome to spice corner dear and thank u for ur kind words. do check AFAM-watermelon round up and i am sure u will find many more interesting recipes of using watermelon:) by the way, i like ur name. what does athika mean? hey darling:) hw have u been? busy with ur folks? Bit unusal recipe indeed...looks so colorful and you are right..adding extra cumin and jeera makes it special too..gotto try it soon before the summer..
A very innovative recipe supriya. I have read abt making pickles with watermelon rind. but making dosa ... I think no body would have tried this and is a very creative recipe dear..
Just wanted to let you know that I made this recipe just this morning and it came out excellent. I had my boyfriend try and guess what was in them, and he had no clue. Mine looked almost exactly the same as the ones in your photos. I had trouble spreading the batter, though, due to the onion pieces. Also, is this supposed to be crispy in the middle? I was able to get it crispy on the outside, but it was very soft inside (not quite "uncooked" but soft nonetheless). I'm wondering if this is just due to the nature of the watermelon rind (since I've had a similar experience with cucumber dosa). Oh, and I also soaked the rice overnight, using 1/2 c. iddli rice and 1/2 c. sona masuri rice -- just in case anyone is looking for a variation. I also made the ginger-coconut chutney, which was just superb. I plan on serving that many more times in the future. And it paired perfectly with the watermelon dosa. Thanks for another wonderful recipe. Will let you know as soon as I try more. i learnt this recipe from my mom who in turn learnt it from her mom:) its very common recipe in our native as watermelon has very neutral taste and goes well with any other ingredient. thanks my dear:) it might sound new to u but as i said to mahi its very common recipe bk in my native. i have not heard abt making pickle with melon rind. now that sounds quite innovative:) do u have any recipe to make pickle? this dosa is meant to me little soft as u spread it thickly. and as u guessed it rightly, other reason is due to water content in watermelon rinds or cucumber(all water based vegetables). if u like a crispy dosa, add little more water to the batter to get any other dosa batter consistancy and spread thinly. I would never have dreamed smething like this...it's unique, and of course looks tasty!! Thanks for the recipe, Sia! Its a new one for me, and its watermelon time too! You got a beautiful layout and a wonderful blog! welcome to monsoons spice:) i hope u like it as much as we do. please do let me know when u give it a try. we tried your receipe by putting watermelon pieces. It was a big flop story. What do you mean by watermelon rind? please explain. Also, let me know how to make the dosa, when it doesnt have any urad dal in it. Check this link. The recipe looks similar to yours.Told you, in case if you are not aware of it..
hi sia.. first time on ur blog.. this is a grt recipe.. i recently saw a rind jam in a blog.. now the is.. have to try it ..